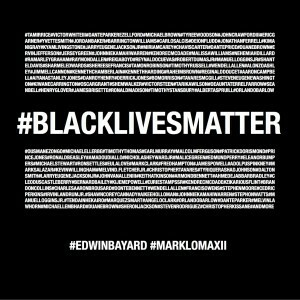 Drummer/composer Mark Lomax and tenor saxophonist Eddie Bayard recently released #BLACKLIVESMATTER, a three part duo jazz album created in support of the #BLACKLIVESMATTER movement and in response to the recent and ongoing tragedies affecting the African-American community. The album release will be celebrated on Saturday, February 21st from 5 to 7pm at Kafe Kerouac, 2250 North High Street (North Campus). The album will be played in its entirety, with an accompanying multimedia presentation and Q&A with the artists following the performance. Tickets are $10 at the door and seating is limited, so getting there early is recommended. The album, which can be downloaded for free here (where you can also read the fantastic liner notes written by poet Scott Woods), is a powerful combination of revolutionary speeches of the last fifty years with soulfully forceful playing from Lomax and Bayard. The insistent speech by Jeremiah Wright that is sampled to open the album sets the tone first thing – educational, slightly humorous, but, most importantly, yearning and striving for change. In Part 1, “Amerikkka,” after slowly building behind the speech, Lomax tears into a military cadence and Bayard follows with a slanted chorus of “God Bless America” before taking off into an open-ended solo. Much of the music herein, in a somewhat similar fashion to Lomax’s Isis & Osiris (2014), voyages between free jazz and a spiritual form of hard bop. The musicians toy with structures and melodies, move into more chaotic, open territory, and then return to a structure of some sort, all while staying in sync with each other. The frustration that gave rise to this project is evident in Bayard’s and Lomax’s contributions, with fierce solos and often jagged lines, but the listener can also feel the presence of a solemn hope, as melodic portions show the players’ desire for a more harmonious balance that can result from change. The positioning of a variety of sampled speeches provides a more direct presentation of the feelings on display, and drives home the themes that Bayard and Lomax are wrestling with in the studio and in life. The album shows the strength and impact that jazz (and music in general) can still have when enough skill and emotion are involved. Below are two promotional videos to give you a taste of the album and a preview of the multimedia performance. Lomax has been busy lately – after the release of #BLACKLIVESMATTER, he then released Modern Communication in Ancient Rhythms, a 7-track, 25-minute solo drum set album that is the first in a series of solo recordings. Check out the link to sample the piece, which is available as a “Name your own price” download as well as a musical score. Stay tuned to Lomax’s website for details on future releases and performances.